The 2018 Trilogy Challenge is in full swing, as tons of events across the country are being organized to raise funds and provide players with an awesome one-day tournament. If you’re new to the Trilogy Challenge idea, keep reading! Each year, Dynamic Discs, Westside Discs, and Latitude 64 release a special disc that’s available only at these events. Anyone can run a Trilogy Challenge, and we make the process of registration, organizing players packs, and more super simple. The format can be anything you want - a flex start, one round, random dubs, whatever you think will offer the best turnout in your area. 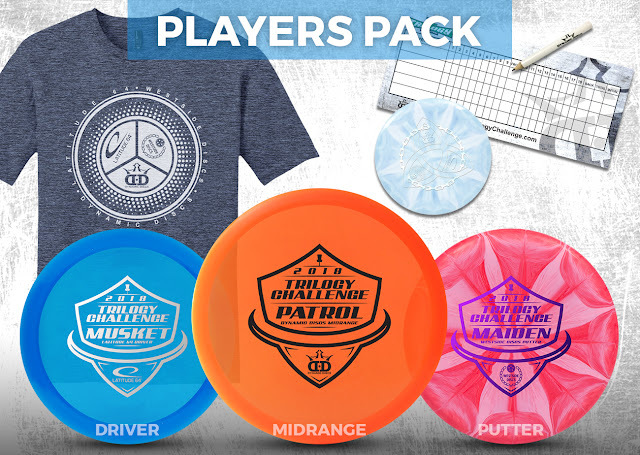 Funds raised can go toward course improvements, club reserves, bag tags, or anything else that could benefit your local disc golf scene. In this video, both Danny and Anthony played in a local Trilogy Challenge in Emporia. They got to chat with players to see how they liked this year’s discs, and are proud to report that the TD was able to raise over $500 for new tee pads at the New Life Church course. Interested in running your own event or want to know when there’s going to be one in your neck of the woods? Visit the Trilogy Challenge website for all the details you need to get started.